- Scan of the girl byFenafir. it's simple and clean! and you used very calm colours such as light blue and white which gives off a very calm atmosphere! ahaha yes i don't find it very spooky though :D! the background looks totally great, which blends in well with the rest of the wallpaper! Wow... Amazing work! Its truly stunning! Thanks for sharing a beautiful masterpiece! Gorgeous vector and the colors look great. Keep it up! The roses looks really pretty! Augh Moon-chan, I wrote out my whole comment on this yesterday and then the power went out! How mean >_< But I'll try to remember. First off, I love it! It's beautiful, so mystical and fantasy-ish...I think the unicorn is my fave! I love the colours and everything, and wonderful vectoring! Very nice vector, the colors are sweet and I LOVE UNICORNS! Good work. It is beautiful! Arigato, Moon-chan! It is simply gourgious <3 It's even in blue tones. I love blue... This is simply amaizing. I really love this vector wallpaper. I'm so happy that someone did this Sumi Keiichi scan cause it was my most favorite one. 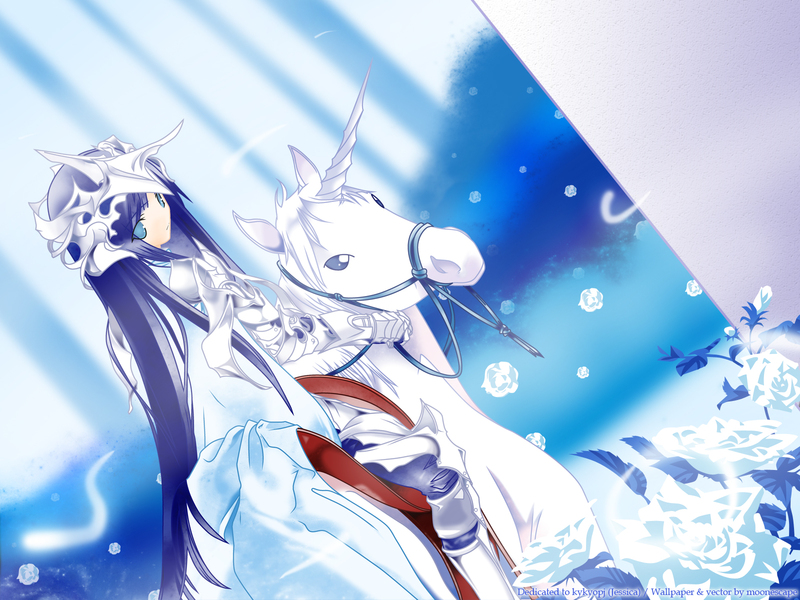 The girl and unicorn are fabulous and I really love the effects you did for the background and how you use the blue. Very medieval fantasy-ish. Excellent work! This is absolutely amazing <3 I love the colours, they're really smooth for the eyes. Oh I love everything about this wall! Keep up the good work! its so nice^^ it remembers me on something. Doesn't have every one someone like a knight in shining armor? wow great work. i really like it specially her eyes. im a sucker for pretty eyes. love the bluuu......its so pwetty! :D so gorgeous....another great work from you!